Has anyone seen the movie Loving Vincent that is in theaters now? The trailer is so captivating and it's received a lot of praise , I'm dying to see it! The movie is a really interesting take on a biopic about the world's most famous painter - Vincent van Gogh. Even from the few clips that I've seen, you can really tell that the film is a labor of love by directors Dorota Kobiela and Hugh Welchman. By commissioning tens of thousands of oil paintings from different artists, the filmmakers take on the question: What if van Gogh's paintings, with their vivid colors and bold brush strokes, had been able to move? If you live in the Milwaukee area, the movie is playing at the Oriental Theater on North Farwell for the next week or so. I'm planning on seeing it over the weekend. 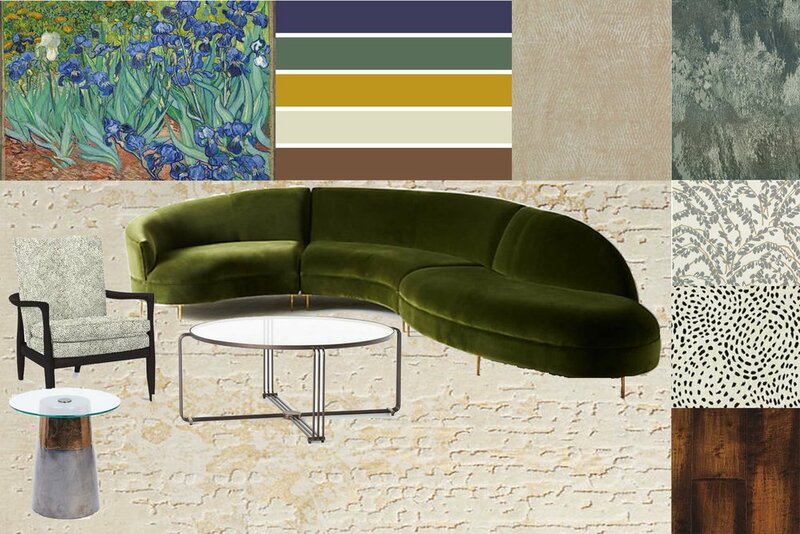 Art and design have always had a symbiotic relationship and van Gogh's work has been a direct inspiration for us when designing for Clients. 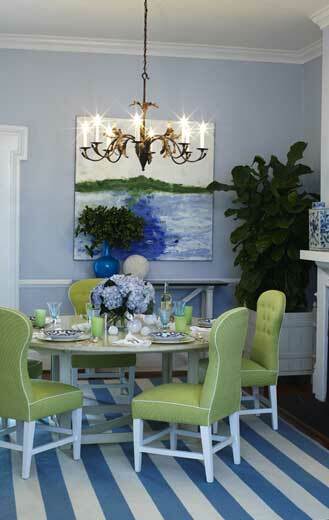 We've even used the Almond Blossom painting shown in the banner as wallpaper in a Client's dining room. A particular favorite element of van Gogh's subject matter to us is his ability to combine saturated, vibrant colors with natural earth tones. An exemplary painting of this juxtaposition is the 1889 work Irises (oil on canvas, 29 1/4 × 37 1/8", J. Paul Getty Musesum). The painting features various shades of green, blue and yellow against the natural browns of the soil. We were so inspired that we put together a style board based on this painting. We love talking about what inspires us while designing - check out a previous blog post about John Rawlings's influence on interior design. We are always on the hunt for the perfect backsplash tile. Recently, we have been remodeling a lot of kitchens. Right now we have seven active kitchen redesigns or full gut-remodels (like this in-progress one)! We will be photographing a couple projects over the next couple of months and we're excited to show you. It is always a pleasure helping families remodel the heart of their home. I'm a sucker for an arabesque tile. The shape gives a nod to historic Morocco while still easily translating into a contemporary design. The tile really works well with kitchens that already have clean lines through simple hardware and shaker doors. When clients have a more traditional or transitional aesthetic preference, having too many straight lines can come off cold and contemporary. The interplay of curved lines adds a touch of femininity, movement and elegance. The shapely arabesque comes in so many finishes and material. We've seen them made of natural stone, concrete, glass, ceramic... there is no shortage of arabesques right now! For a client's lake house on Pretty Lake in Dousman, WI, we chose a crackle ceramic arabesque mosaic in polished dove gray from MSI's Highland Park collection. We paired this with a stunning Calcutta marble quartz and white shaker cabinets. If you decide to go bold, then you can't do it half-way. You need to fearlessly install the tile all the way to the ceiling for a big impact. When you find a tile you fall in love with, there can never be too much! We used the tile to the right in a bathroom remodel that we will be photographing in early September It has a nice balance between contemporary high-contrast and traditional shapes. You can find this marble mosaic at Glazzio Tile. There is nothing more luxurious than a beautiful natural stone tile, particularly marble and travertine. I'm obsessed! Not only is this material timeless, but natural stone tile is universally loved by homeowners and designers, which gives the look top-notch staying power. If done right, a natural stone backsplash will still be a big hit with potential buyers, whether you’re selling in five, 10 or 15 years. Natural stone works best when installed on an entire wall to give the illusion that you have a slab running from countertops to ceiling. If you don't have any breaks in your cabinets, then try a natural stone mosaic like the one pictured to the right (from DalTile). We just put this tile in a Thiensville kitchen remodel and it adds so much texture to the space! Natural stone isn't without it's maintenance - you have to seal it like you would stone countertops and it's not impervious to water. If you like the look, but aren't keen on the up-keep then there are plenty of porcelain tiles out there that look very close to natural stone. This tile from DalTile is one of my go-to porcelain tiles for bathroom flooring. The only downside about the porcelain versions is that it doesn't quite have the same variation you get tile to tile with natural stone where no one piece is the same. In my opinion, every room needs a some degree of metal accents to add texture and drama. In the last 5 years, metal tiles have come a long way. Metal tiles were once thought of as too clinical and cold for residential spaces. But like concrete floors and cage pendant lights, metal tiles can be seen in homes of all styles today due to the increasing variety of tile created; stainless steel, copper, bronze, gold and nickel backsplashes have become a hot trend for kitchens and bathrooms. Aside from its good looks, metallic backsplashes have incredible durability and protective qualities when it comes to handling water and grease. These metal tiles really are just as easy to keep clean as your stainless steel appliances. 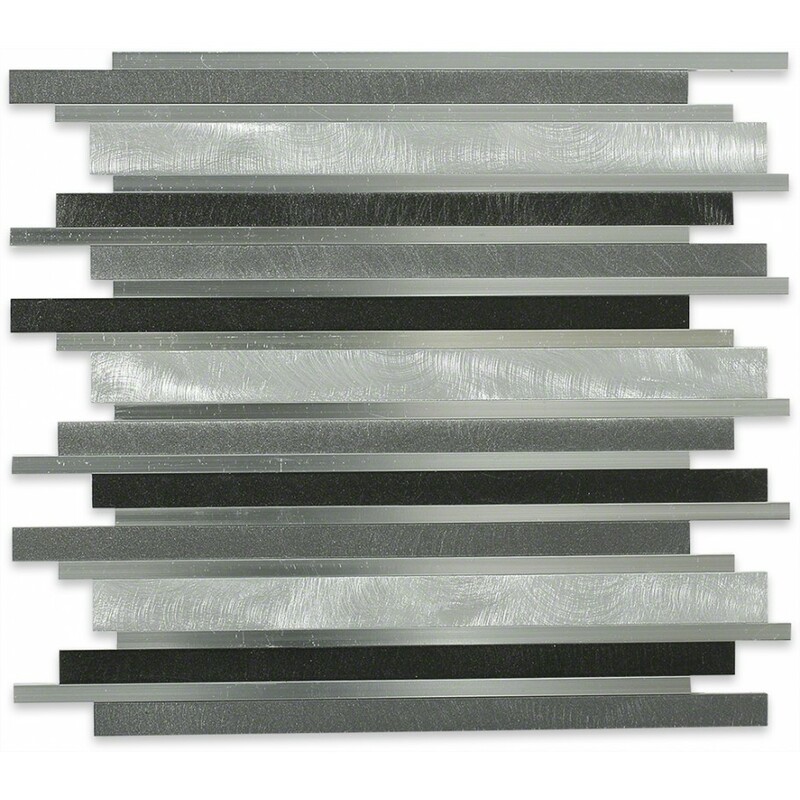 We are proposing the tile pictured for a kitchen backsplash we're doing in Muskego, WI next month! You can find metallic tiles from all of the large manufacturers, but his tile is from TileBar. Subway tile will always have its own place in design. It's just about as classic as you can get! When in doubt, DIY'ers seem to default to the 3x6" white ceramic Subway tile, but there is so much more out there. Each tile manufacturer has it's own spin on the subway tile, whether it's an elongated shape, hand glazing, made of glass of crafted from luxury material (like this gorgeous marble subway tile I put in the Lilly Road kitchen). With all of the options out there, no two houses with subway tile should look the same! Another trick to make your subway tile look more special is to install it on the ceiling as well like we did in this charming house's bathrooms. With so many options out there, we'd understand if you're feeling a bit overwhelmed! We're here to help - whether it's just adding in a new splash to your kitchen or totally remodeling your kitchen. Are you ready to discuss updating your kitchen? Contact us today to get started! Click to view Mainframe (North)'s portfolio on their Vimeo channel. My coffee table came in... and I love it! As I mentioned in a blog post last week, I am making a few updates to my own home this summer. As an early birthday present, my wonderful mother helped me buy the Pebble Coffee Table from West Elm (thanks Mom:). I'm waiting until later this summer to post photography of my entire home and office, but I'm just too excited about the coffee table not to post about it! Both the shape and surface reflect the smooth river rocks that it was named for. The table is smaller than the old one Eli and I had, but it fits the proportion and aesthetic of our 800 square foot home better. Take a look at the shots I captured today of the table below. You'll also notice another early birthday present in the photos, this time from my sister - a copy of Hi-Fructose Magazine signed by Margaret D.H. Keane (thanks Val:)! Inspired by a recent 3 Chairs post, I spent the afternoon pretending I had an unlimited amount of money to spend on Etsy. It is a seriously addicting game and I found it difficult to narrow my selections down to 10 picks. I often overlook Etsy as source for clients, but it really does have a great selection of original decor, pottery and artwork. See my top 10 favorite products below. I'm seriously in love with the mix of vintage and modern pieces above. I'd love to pair the fruit pillows with the Birossi vase in an eclectic room! Feel free to share your favorite Etsy products or shops in the comments. Good art that fits into an already designed room can be VERY hard to find. Unlike furniture and lighting, which should be both functional and decorative, art is purely decorative. Everyone's aesthetic tastes are different and artwork can be quite expensive, so there is a lot of pressure for you to really love the pieces in your home. With my art background, it's probably no surprise that I often draw inspiration from the art world for my own designs. I've even filled my own home with a large variety of art - paintings I've found from Goodwill, sculptural figures from my travels, beautiful pottery, family heirlooms and my own creations. I love almost all types of artwork and personally want to surround myself in things I like. The more the better! Go big. Skip the 8"x10" prints, they're too small to make an impact in your home and run the risk of looking generic. Try buying a standard size. This will help save you money on framing, which can be shockingly expensive. Check IKEA or Target before going to a specialty framing shop. With that said, if you invested a lot of money in a painting, then it could make sense to have it professionally framed (these shops really do a nice job). Buy original. Sure, I have some amazing Modigliani and Picasso prints that I wouldn't have been able to buy original, but I also mix the classic works in with original works from emerging artists. A collection with just reproductions can seen incomplete, especially if you really value and support the arts. Buying from emerging artists also gives your collection a chance to appreciate over time; who knows, maybe you are buying the next Warhol. Make a statement. Don't let all of your artwork fade into the background. At least one piece should be a statement or conversational piece in your home. This doesn't necessarily have to be a graphic graffiti piece, but can be something personal to you. Don't get freaked out by pricing. Buying original can sometimes be expensive. But, if you really love the piece and you value artwork in your home, then just remember that you are paying for years of talent, training, and honing of vision. 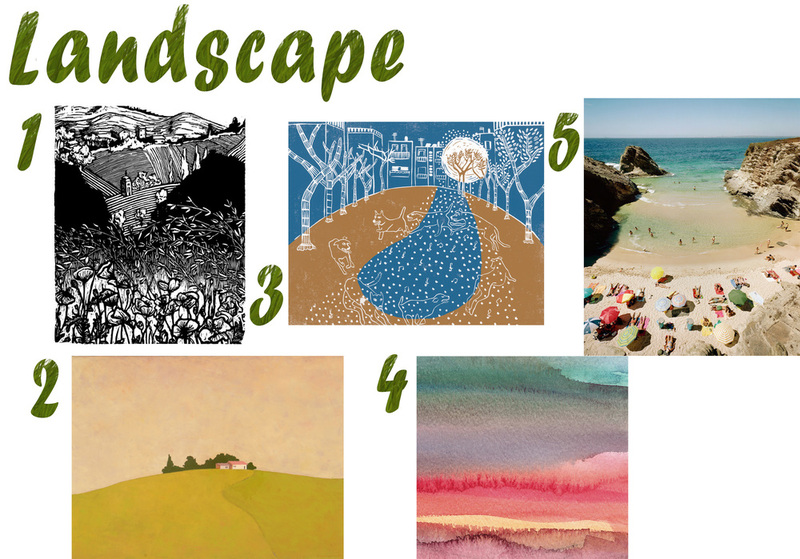 If you want to spruce up your home this spring by bringing new artwork into your home, then take a look at my top picks below. Which is your favorite? Do you need more assistance in selecting, purchasing and framing your new artwork? Contact me today and I can lend a hand. About 3 months ago, my lemon tree flowered for the first time. Recently tiny little green lemons have started to emerge from the flowers. There are about 30 itty bitty lemons on the tree. I'm not sure how the small tree will support the weight of 30 ripe lemons... but I'm sure it can handle itself. Yes, the tree is high maintenance. I keep it under a grow light and spritz it with water twice a day. But, I think the lemons will be ripe by the time summer rolls around. I can't wait to relax in my newly remodeled yard (still in progress - photos of the process coming soon) with a lemonade in hand! Yesterday the state of internet shopping got a little more 'bezar'. Brandford Shellhammer, founder of Fab.com, and his team just launched Bezar.com with the purpose of connecting emerging artists with online shoppers. Taking the same model from places like Fab, Gilt, One Kings Lane and Joss and Main, Bezar.com is a members-only flash sale site for the most unique and curated design goods. The New York City-based e-tailer combines the words "bizarre" and "bazaar" for its name, stating, "We're bizarre and totally cool with you calling us that." The site features product from four categories: ART, HOME, JEWELRY and ACCESSORIES. Each sale will last for only about 3 days, so we will get introduced to 120 new "makers' and brands, emerging and iconic, each month. I'm totally captivated by the aesthetic. It is selection is contemporary and whimsical with a touch of New Age aesthetic. I know I'll be able to find great, unique items for clients here! You can join for free, I just did! I've been spending a lot of my time looking at fabrics for drapery and upholstery for clients. There are thousands of fabric choices out there all ranging in price and usage and it can often be overwhelming when trying to pick just one to feature in your home. One quick tip I have for my readers when choosing fabric is that if you are in doubt when you see it in a showroom or online, then don't hesitate to have a sample cut for you. Take it home and live with it for a few days. If you still love it after the trial period then make the leap and order a few yards. Here are some of my favorite fabrics that I've come across recently. I tend to be drawn to more graphic, whimsical prints that will be feature statement in a room. The fabrics below depict fantastical scenes of interacting animals and mythical creatures. I would love to use either of these prints on an accent chair or ottoman. A small hint of whimsy in a room can help inject an eclectic aesthetic into your home. Folkland Fabric - Admiral by Robert Allen for DwellStudio. Toile fabrics can come off very traditional, but when paired with minimal design the fabric choice can be contemporary. According to Wikipedia, toile is a type of decorating pattern consisting of a white or off-white background on which a repeated pattern depicting a fairly complex scene, generally of a pastoral theme. The two fabrics below when paired with white walls, lacquered furniture, concrete accents and stark decor will come off as a pleasantly unexpected touch. My last 2 choices are reminiscent of the Pop Art movement. The prints below are graphic and look as if they they could have been screen printed onto the fabric. Not sure what fabric to use in your home? Then give me a call - 309.371.6676 - and I'd be happy to pull a few selections for you. I'm always on the hunt for innovative products and industrial design that will help boost the service offerings that I provide my clients. With 2014 just about over, I thought I'd take a look back and compile a list of the top 10 home furnishings that inspired me this year. Enjoy! This minimalist home office desk is perfect for today's modern workflow. The surface is solid wood with a dry erase panel; cables are managed out of sight, while tech devices such as tablets and mobile phones dock seamlessly within the desk surface. Eliminating the need for superfluous equipment, this design provides space and encourages efficiency. Designed by Nordic firm Forsberg Form, the table clock is a modern, minimalist twist on a traditional grandfather clock. The Urbild table clock is made of pigmented concrete and is a replica of the grandfather clock Urbild in scale 1:3,6. A new collection of leather, maple, and black walnut finish modern desk organization accessories add order, beauty, and even improves ergonomics. Designed by Barcelona-based design group Mermelada Estudio, the lamp is inspired by vintage telescopes and the revelations of Italian scientist and astronomer Galileo Galilei. The lamp is an interesting mix of other popular 2014 trends - the tripod lamp and the popular Neil deGrasse Tyson show, Cosmos. With young city-dwellers, who live in smaller places and move more often than an older demographic, in mind, “On the Move” became the theme of IKEA's PS series. This is the 8th iteration of the IKEA PS Collection and this one covers every room in a host of bright colors, lightweight materials, and has multifunction built right in. Now available in a copper plated finish that is intended to patina naturally with handling and age for a unique look. This copper-plated chair ships flat and folds out to become a remarkably comfy (not to mention strikingly handsome) seat for your dining room, living room or bedroom. Welcome to the fold. This paper pendant gives a soft glowing light, that gives your home a warm and welcoming atmosphere. It is easy to assemble and the cord is long enough to hang at any height. I just love this light - it's hanging above my office desk right now! It’s not always the case that a design classic can look refreshing year after year, but the shelving system from String keeps reinventing itself. 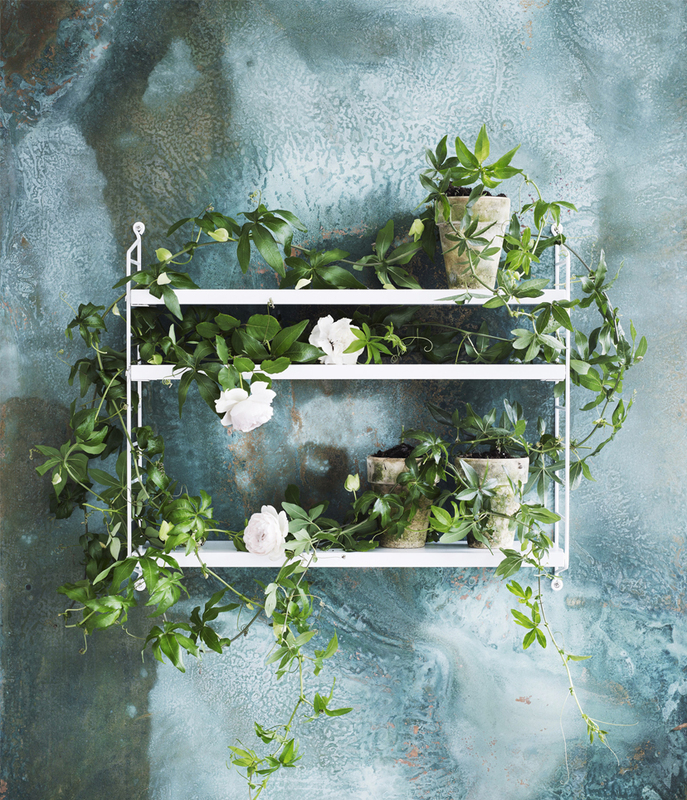 String released Scandinavian-styled photography this year to introduce the String Pocket shelf's new options in green and cobalt blue. The shelves are a great piece of design in addition to being multi-functional. The Magma Rug series is a contemporary take on traditional Spanish Esparto grass rugs. The rugs are handmade from 100% natural material in Spain by local teams of women. The rugs start from different centers which expand to finally generate an organic surface full of energy. Rugs present 3, 4, or 5 central circles in different sizes. They have a very nice specific smell of grass and have a great feel. Norm Architects from Denmark have designed a wall clock with clean lines, stripped of all unnecessary details. The minimalistic Marble Wall Clock’s design allows you to read the hour and minutes of time in timeless fashion. Norm Architects designer Jonas Bjerre-Poulsen says: “With smartphones replacing traditional clocks in our society we’d like to see a renaissance of the classic wall clock, an object not only beautiful but also highly distinguished. The Marble Wall Clock exudes nostalgia, and we’ve chosen a material combination that speaks to most human senses, something very important as a designer."